You are here: Home / The Abundant Table "Ultimate Team Challenge"
On June 18th, 2016 Abundant Table hosted its first ever “ultimate team challenge” at Norwood high school. 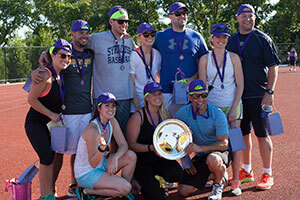 Teams, made up of Norwood residents and friends, came together to compete in a series of physical, mental, and team-based games – culminating in a final obstacle course. Team Mud, Sweat and Beers, captained by NPA’s Mike Maloof, ended up victorious, and walked away with bragging rights and “champ status” for the first ultimate team challenge. Teams were asked to raise $5,000 to participate. At the end of the event, abundant table raised nearly $30,000 – more money generated in a single fundraiser since the organization’s inception in 2003. The weather was glorious and the energy amazing. A big thank you to those members of the community, who competed, sponsored, donated and volunteered. The event wouldn’t have been the success it was without your time and effort! Planning is underway for the second annual ultimate team challenge, to be held on June 17th, 2017, so mark your calendar, and please consider joining our team! The Abundant Table relies 100% on community financial support, so big events such as this allows us to keep doing the work we do, which is serving those in need! Thank you!